When the ITV / University of Cardiff (YouGov) Opinion Poll was published on April 24th showing Conservatives well ahead of Labour for the first time, I was tempted to revise my forecast for the Welsh Council Elections. After all, I was assuming that the Conservatives would gain about 80 extra seats, and Labour lose about 155 seats. This was based on vote shares of 16% and 29% from 13% and 36% shares in 2012 (which did exclude Anglesey, one of the smallest of the 22 councils). In 2012 GE voting intentions were over 50% for Labour and below 25% for the Conservatives. So the switch in fortunes from the opinion poll was dramatic, as shown by the YouGov graph below. I stuck to my forecast, as can be seen from Figure 1 of my summary of the three forecasts for England, Wales and Scotland on 25th April. 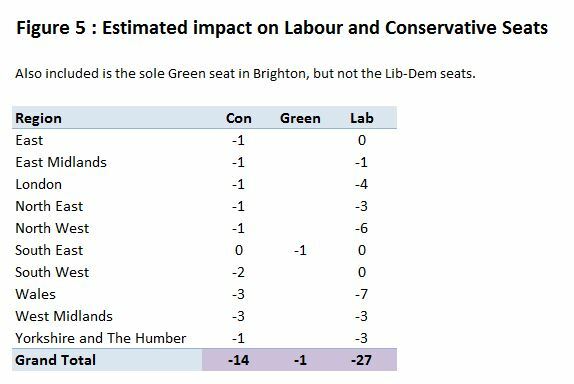 Although quite accurate for overall, the party where I was most inaccurate in the forecast was with the Liberal Democrats. I expected them to make some sort of recovery from the poor showing in the 2012 election, but still be behind 2008. Given that they also had a small loss of 28 seats in England when then were expected to make gains, this might dent hopes of their regaining some the Westminster seats lost in 2015. I over-estimated the Labour Party seat losses in Wales, like I did in Scotland and England as well. In Wales the 472 seats compares to the 340 seats gained in 2008. It seems that in Wales Jeremy Corbyn is turning out to be less of an electoral liability than Gordon Brown. Although the financial situation was worsening by May 2008, the real start of the credit crunch was the collapse of Lehman Brothers on September 15th 2008. The Other & Independents (mostly the latter) are fairly easy to forecast. As I noted in my forecast, the number of seats has been fairly stable since 1999, though this time there was less change than from other elections. It is with the Conservatives forecast that I was most accurate. Across Wales, Scotland and England I forecast 530 seats gained, against 563 actual. I was fortunate in ignoring the YouGov poll, which may turn out to be a rogue one. Even though the poll showed for the Local Elections the Conservatives still behind Labour, they were only 2% behind. By my rough reckoning from seat numbers Labour gained 31% of the vote (down 5% on 2012) and Conservatives 16% (up 3% on 2012), thus 15% behind. The changes are far short of the poll (ITV’s graph reproduced below), so indicates that the headline forecast that the Conservatives will get more Westminster seats than Labour in Wales (21 to 15) is incorrect. A previous forecast for the Scottish Local Elections was made before the General Election announcement on April 18th. Upon reviewing the forecast, I found that I had not allowed in the forecast of changes in numbers of council seats, for the impact of different average population per council seat. Allowing for this factor roughly offsets the movement in opinion since that announcement. In particular the fact that a Labour Councillor represents on average a large population than a councillor from other parties offsets the impact of a small increase in support for Labour since the General Election announcement. I see no reason to revise significantly my previous forecast of Labour to lose 250 seats, with the Conservatives to gain 150 and the SNP 100. After the General Election was announced at least two Scottish opinion polls of Westminster voting intentions have been produced – one by Panelbase for The Sunday Times, the other by Survation for the Sunday Post. Both polls show the SNP down and both the Conservatives and Labour up slightly. One problem with using this opinion data is that people might vote differently in the local elections. For instance, in Scotland as a whole, Independent candidates in 2012 received 12% of the First-Preference votes and won 16% of the seats. I would expect that that the SNP would lose out the most to Independents, followed by maybe the Conservatives and the Liberal Democrats. This hypothesis can be validated against the data. The University of Strathclyde’s “WhatScotlandThinks.org” has the opinion poll data going back to 2007. For 2007 and 2012 I compare to percentage shares of seats votes with the opinion polls nearest to the local elections in Figure 1. There is a result that I did expect. That is the Conservatives did comparatively worse in terms of seat percentage to opinion poll percentage. This was worse in 2012 than in 2007, as their share of First Preference votes fell in many wards below the threshold required to win seats. What I did not expect was that the SNP’s seat share was about the same as the opinion poll percentage in 2007 and slightly above that level in 2012, despite Independents winning 16% of the seats. Most unexpected is the Labour Party, which has the biggest deficit between opinion polls and seat share. There are three vague factors, that might be valid. That is different voting behaviour in local elections and general elections; lower voter turnout in Labour-voting wards and inaccuracies in the opinion polls. In the first it could be that some people were voting SNP in the local elections and voting Labour in General Elections. But this does not gel with what happened in the 2011 Scottish Assembly elections and the 2015 General Election. There is another factor. Local Councils represent different populations, which only partly reflected in the size of the council chamber. The most populous is Glasgow, with an estimated mid-2015 population of 606,300 and 79 Council seats. The least populous is Orkney Islands, with an estimated mid-2015 population of 21,500 and 21 Council seats. So a Councillor in Glasgow will represent nearly nine times the number of people as in Orkney. There are good reasons for this differential. If the Councillors per head of population were made roughly equal (4390), then Glasgow council chamber would increase to 138, and Orkney would reduce to 5. But this does impact overall. Using the 2012 seats and within each council, dividing the population by the seats, gives figure 2. About half of the difference between the Labour Party’s differential between First-Preference vote share and seat share can be explained by the fact that their support is concentrated in the larger council areas where the average seat population is larger. 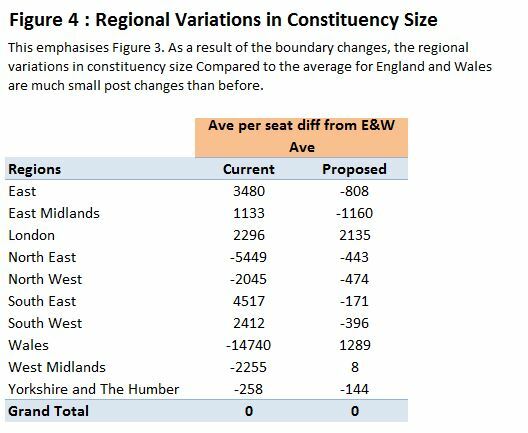 The SNP were also impacted by larger than average seat population , but not by nearly as much. 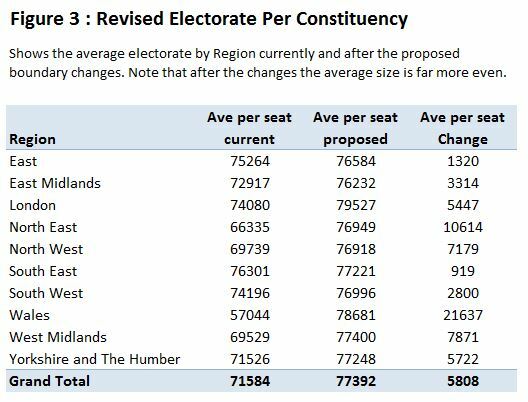 This does not matter for seats won on councils, but it does impact on the net change in council seats. In particular, like others, I believe that the SNP will make large gains from Labour in the cities and larger towns, with Glasgow being the key area. But I also believe that the SNP will lose council seats to the Conservatives and the Independents. For this reason, I estimate that the average SNP seat population will increase by about 5%. With it they should gain control of 5 to 10 councils. However, if the drop in General Election support is from around 47% to 41% the net seat gain could be around 50, instead of the 100 previously predicted. Labour are hit with three combined impacts of the likely fall in the first prefence votes. First is the failure to reach the threshold first preference votes to win seats. Second is that this threshold will be a higher percentage of the vote than for the Conservatives or the Liberal Democrats, as Labour have fielded more than one candidate in nearly 150 wards. With such a low share of the vote, under the STV system Labour Party candidates will be competing against each other for votes. Third is that Labour have larger than average population per seat, so the percentage of the seats won will be lower than the opinion polls suggest. For these three reasons combined, even if the General Election show a slight recovery from 15% to 18% of the popular vote, their share of the Scottish council seats won, could be still be less than 13% of the total, the point where total number of seat losses exceeds 250. For local council elections Scotland adopted the Single Transferable Vote system in 2004. This May sees the third set of elections using the new system, the others being in 2007 and 2012. Under this system the local wards have a number of seats available. Just over half of wards have three council seats, with the rest having four council seats. But the majority of seats are in wards with four seats. There are up to five main parties (SNP, Labour, Liberal Democrats, Conservatives and Greens) and Independents fighting for those seats. The problem with trying to win a majority on a council is that the Party must try to win at more than one seats in every ward. But each voter only gets one vote, so multiple candidates of each party are competing for first preference votes with each other as well as candidates from other parties. If a Party believes that support is low in the area then they put forward just one candidate. If support is well over half of the electorate, then the Party might put forward three candidates, knowing that at least two candidates are likely to get elected. If the Party gets this wrong, and fields too many candidates, then its vote will be split. Most commonly fielding two candidates instead of one is a gamble. If got wrong the Party could either end up with either no seats instead of one. or one instead of two. This means a realistic prediction is necessary to optimize the number of seats. Elections Scotland has now published a candidate list for the forthcoming May elections. I have summarized the candidates per ward in figure 1. The top section is a count wards where there a particular number of candidates. For instance in 27 wards the SNP have 3 candidates. The Green Party only has 1 candidate in each of 218 wards. The middle section has the maximum council seats that a party can win, and the percentage of the 1223 council seats in Scotland. For the Independents the maximum seats is based on the assumption of only 3 seats per ward. Allowing for four or more candidates in four seats wards would make the theoretical maximum slightly higher. The lower section gives the number of wards out of 354 with candidates and without candidates. The results are surprising at first, particularly for the SNP who in the Scottish Parliament elections 2016 won 48.8% (63/126) of the seats, yet can win 51.3% of the seats available. Even allowing for about 14% of the vote in Local Elections going to Independents (source : Table 6 Lincoln Report on Report on Scottish Council Elections 2012) this appears to lack ambition. But comparison of the candidates to seats gained last time and position in the opinion polls in Figure 2 clarifies where the big anomalies lie. The lower section of Figure 1 has been replaced by two more sections in Figure 2. First is the seats won 2012 and the ratio of the maximum seats that can be won (identical to the number of candidates for the Political parties) to those seats won. In 2012 the SNP won 425 seats and in 2017 has 627 candidates. It therefore has a maximum seats to 2012 seats ratio of 1.48. Second is the approximate value of recent opinion polls (less 14% to allow for the Independents)¹ and the ratio of maximum seat share to opinion polls share. When comparing the figures between the parties the Liberal Democrats and the Greens do not really figure in the issue of having too many candidates. The comparison is between the three major parties. It is here that the Labour Party clearly stands out. They have only got 15% more candidates standing in the local elections than Councillors elected in 2012. But, based on current opinion polls they have far more candidates standing as opinion poll ratings would suggest is ideal to optimize seat wins. The MSS / Polls ratio is partly exaggerated by the very low standing in the polls. But given that standing they should be adopting a similar strategy to the Liberal Democrats and the Conservatives. That is to only field more than one candidate in a ward where there is a reasonable expectation that the additional candidates will not compete against each other and lose seats. So why has Labour decided not defy the realities of the voting system? A strong reason is suggested in Figure 3. In Figure 3 I have selected the 16 councils where Labour have (a) Candidates for at least a third of the seats available & (b) At least 10 Candidates. This is half the 32 councils in Scotland, but with 75% of Labour Council Candidates in 2017 and 82% of the seats Labour won in 2012. Numbers of candidates by council for the elections in May 2017 are compared with the seats won in 2012. To promote the idea that Labour can still be the major party on the council, and be capable of a majority on 7 of these councils. This is especially important for Glasgow and North Lanarkshire, where Labour are currently in the majority. To help prevent second preferences being given to other parties. However, if the Labour share of the vote on May 3rd is well below the 31.4% achieved in the local elections 2012, I predict the policy of aligning 2017 candidate numbers to seats held will result in a percentage of seats won will be significantly below the vote share. 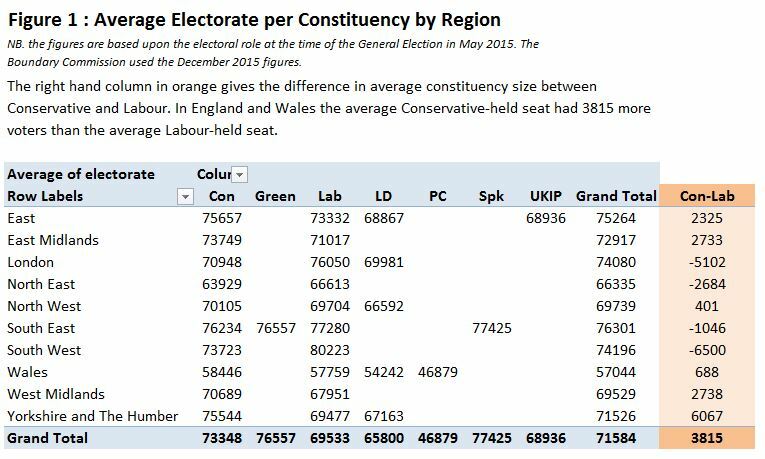 It is in those councils where Labour are currently strongest, the this disparity will be the widest. Top of the list of failures is likely to be North Ayrshire Council, where there are 17 candidates against 10 seats being defended. I have assumed for General Election polling SNP 47%, Labour 15%, Conservatives 25%, Lib-Dem 6% and Green 4%. From the University of Strathclyde Scottish Opinion Poll Tracker the latest poll is for March 17. The figures are SNP 47%, Labour 14%, Conservatives 28%, and Lib-Dem 4%. Using these figures would make the Labour Candidate numbers even more out of line with the SNP or the Conservatives. In the UK it is possible to raise a petition to Parliament. If that petition obtains 10,000 signatures, there is a written response from the Government. If there are more than 100,000 signatures, the matter is discussed in Parliament. In less than two years 48 proposals have been discussed in Parliament, with another 14 pending. By far the largest was for EU Referendum Rules triggering a 2nd EU Referendum, which had 4.15 million signatures. It was never going to get far, as it would have meant changing the rules for the referendum vote after the vote had taken place. But it acted as a protest for the substantial and vocal minority who did not like result. The signatures by constituency are available for download. There are a also non-UK signatures, which I shall ignore. 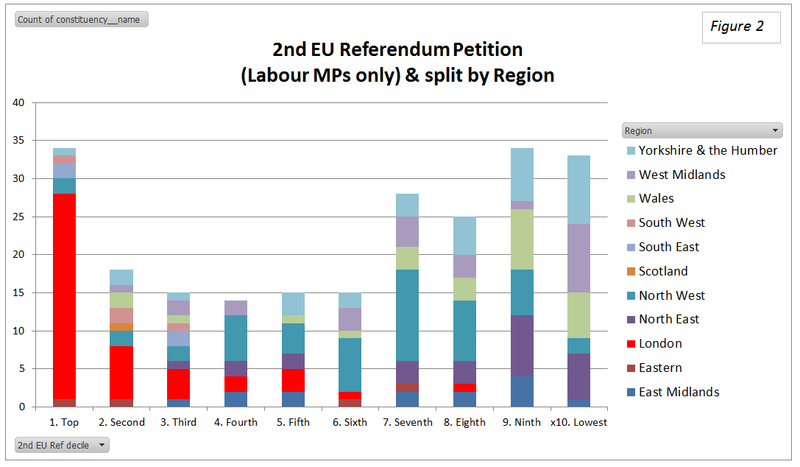 I ranked the signatures by constituency, and divided the 650 constituencies into tenths, or decile groups. The constituencies I then classified by political party of the current MP, giving the graph shown in Figure 1. 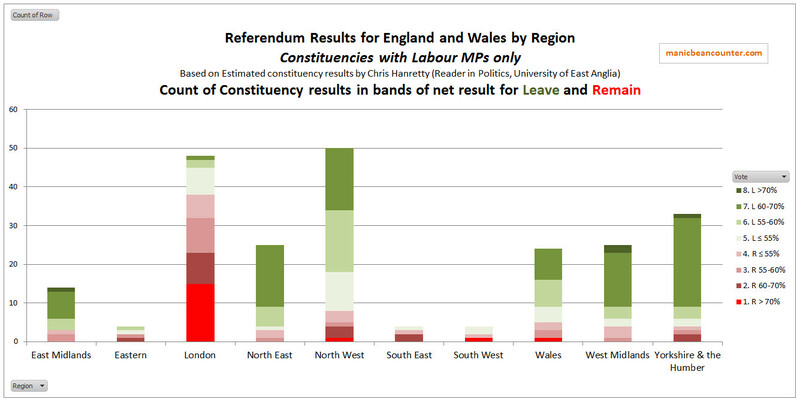 Compared to the Conservative constituencies the Labour Party has a few dominant activist constituencies on in terms of wanting to overturn the EU Referendum results, whilst most are far less active. 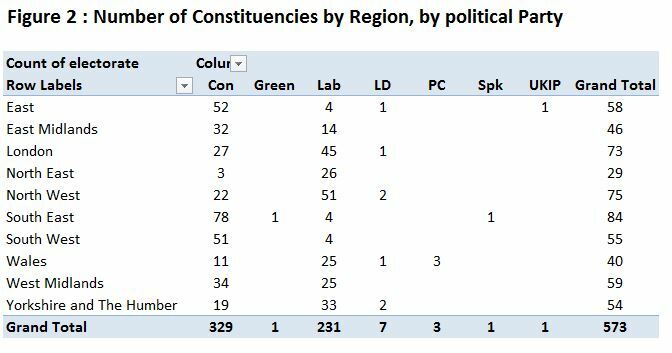 It is even worse if you include the SNP, many of which were Labour constituencies prior to 2015. Figure 2 splits these 231 Labour seats into the 14 regions. Of the 34 Labour-held seats in the top decile, 27 are in London. The Labour heartlands of the North of England. parts of the Midlands and in Wales are far less activist. Those 27 London constituencies (or 15% of Labour seats) registered 41% of all signatures in Labour seats. 15% of Labour seats registered slightly more signatures than the lowest 140 or 60%. 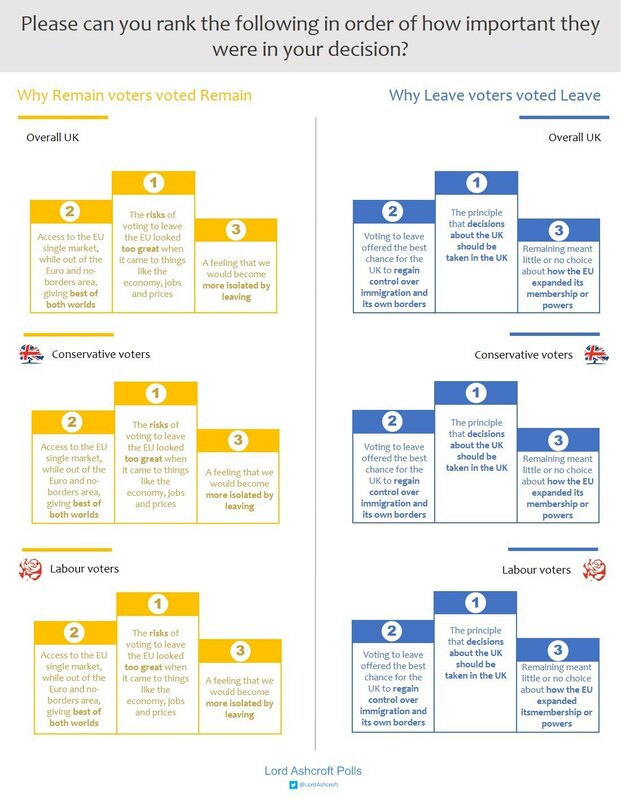 This lines up with the an analysis of the estimated split of the EU Referendum vote I did last year, and shown again as Figure 3. The Labour seats that most virulently voted remain in the EU that are unsuprisingly the Labour seats with the most signatories who wanted to overturn the democratic result that goes against them. 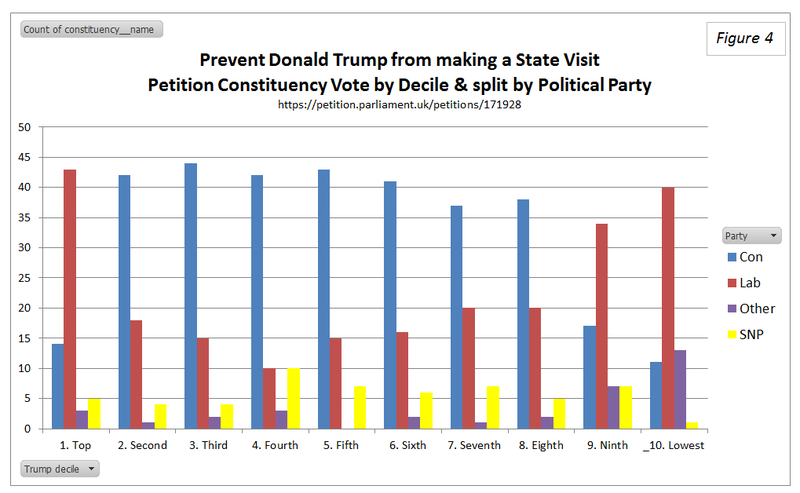 But it in terms of signatories, London-based activists skew the result even more, meaning that within in a political party their views are likely dominant over the those held in the majority of Labour-held seats. 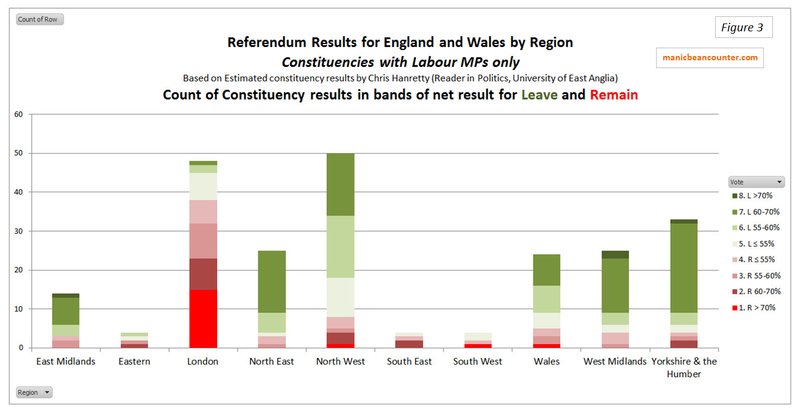 As Labour Party members are mostly pro remain, this means that going with party and not will the majority view in the constituencies that they represent. There is a similarity with attitudes to Donald Trump’s prospective State visit to the UK. A petition against this is Prevent Donald Trump from making a State Visit to the United Kingdom. This currently has 1.85m signatures up from the 1.82m when I downloaded the figures a few days ago. Figure 4 shows the decile groups by political party of the current MP and the Figure 5 shows the split by region of the labour constituencies. The Labour constituencies dominate even more the top 65 of constituencies by signatories, with the same 27 London constituencies being represented in the top decile. With 15% of Labour seats they registered 32% of all signatures in Labour seats and registered slightly more signatures than the lowest 144 or 62%. A very similar pattern to the EU referendum. 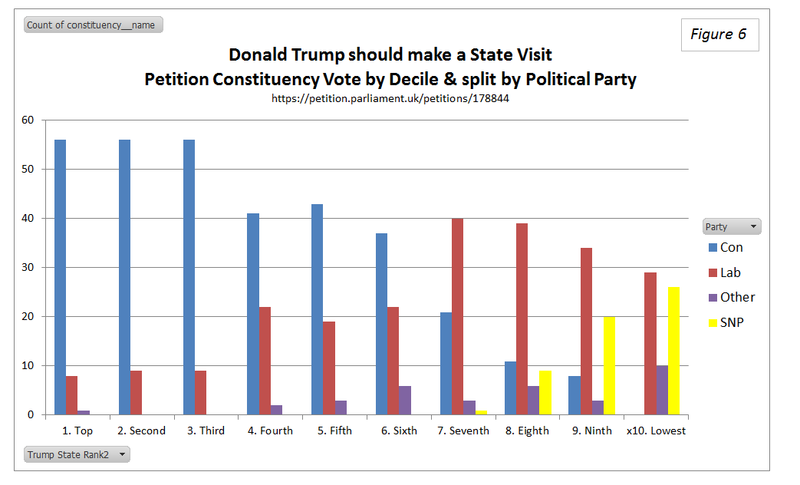 This petition has been countered by Donald Trump should make a State Visit to the United Kingdom. With just 307,000 signatories or one sixth signatories of the Prevent State visit, it might nor seem as relevant. Figure 6 and Figure 7, are from when the signatories were about 275,000. 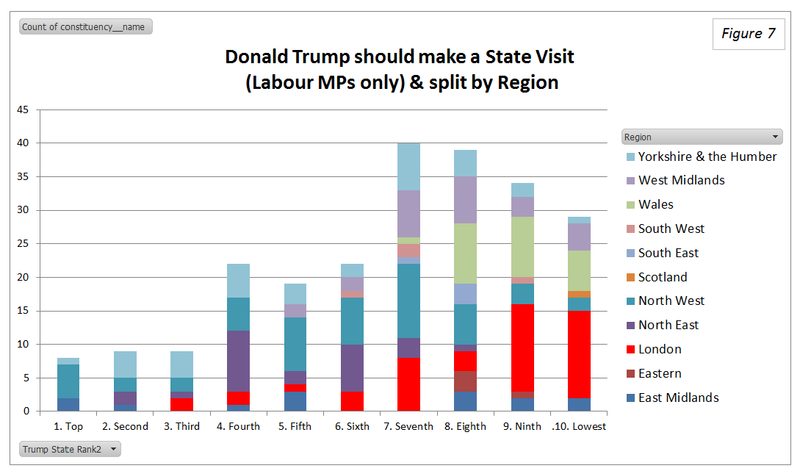 The Labour constituencies are fairly united in their apathy for wanting a Donald Trump State visit, but are divided in the expressed opposition to a state visit. 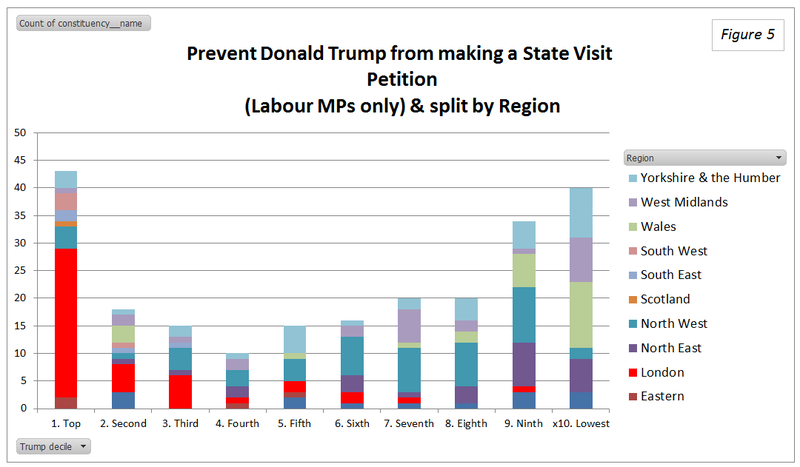 But are the far greater numbers of the “Stop Trump” signatories reflected in the wider population? YouGov Published an opinion poll on 1st February on the topic. 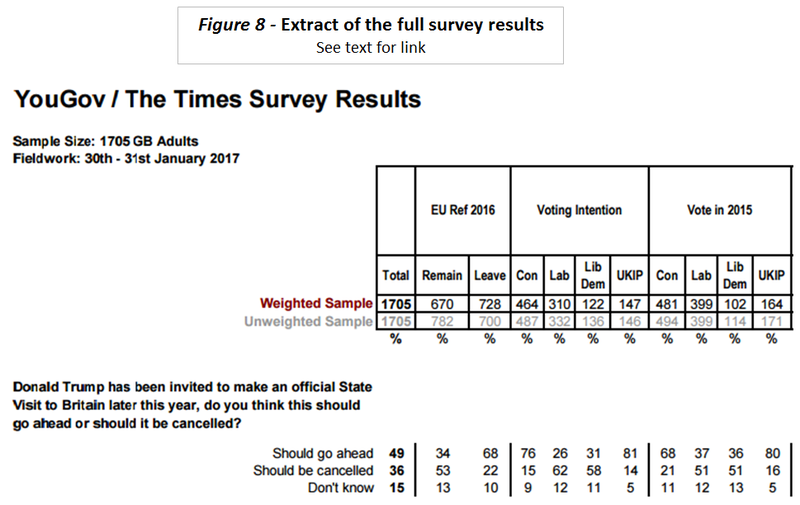 Almost half the sample thought the state visit should go ahead, whilst just over a third thought it should not. In the detail, the poll also divides the country into five regions, with London separated out. Even here, the opinion was 46 to 38% in favour of the Trump state visit. The real problems for Labour are shown in the extract of the detail in Figure 8 below. Those who intend to vote Labour now are a smaller group than those who voted Labour in 2015. Proportionately if 30.4% voted Labour in 2015, 25% would do so now. In the unweighted sample, it implies around 70% of the of the 67 lost would support the state visit. The remaining Labour voters are much more against the majority who expressed an opinion than in GE2015. This indicates a party in general decline. That the opinion seems to be centered on London, this indicates the collapse in the Labour vote has in the traditional Labour heartlands of the Midlands, the North and Wales has further to go. Yet if the visit does go ahead it is the noisy protesters that will come out in their thousands, the majority will be Labour supporters based in London, who shout down everybody else.